Exchange 2013 site mailboxes are a great new feature, but several configuration steps are necessary before rolling them out to users. There are several new features available in Exchange Server 2013, but one that's getting plenty of early interest is site mailboxes. 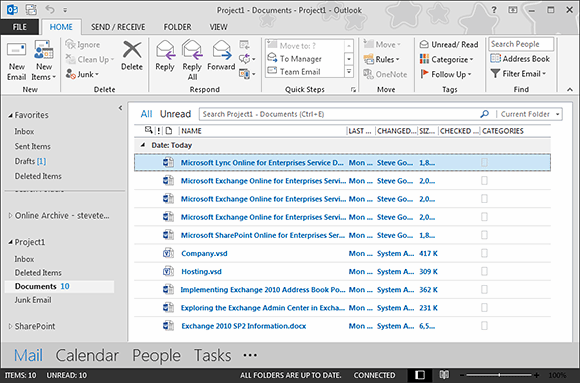 A site mailbox combines the messaging features of a shared mailbox with the document storage capabilities available through SharePoint 2013. This tip lays out the steps necessary to configure a site mailbox in a lab environment. If you want to use Exchange 2013 site mailboxes, the first thing you must do is ensure that you have a SharePoint 2013 environment that will serve as the document library and enabler. Install SQL Server 2012 Standard Edition with Service Pack 1. Install SharePoint Server 2013 Enterprise Edition into a new farm. Set up the basic configuration for SharePoint 2013 (defaults). Create a new HTTPS Web application and site collection, then assign a trusted certificate to it. Set up the User Profile Synchronization service. Install the Exchange Web Services Managed application programming interface (API). Run scripts on both the SharePoint 2013 server and Exchange 2013 server to configure and enable site mailboxes. Create a new site mailbox. This seems easy, doesn't it? It is, but there are plenty of steps required to actually get there. Let's start with prerequisites. As with any Exchange installation, first make sure that it's in a working state. Specifically, make certain that you've configured and tested the Exchange Autodiscover service and that you're using a valid third-party certificate (or an internal certificate authority). You'll also need a valid certificate for the SharePoint 2013 farm that will help host your site mailboxes. If you're using a Subject Alternative Name (SAN) certificate for Exchange 2013, consider adding your SharePoint 2013 HTTPS site name to the certificate. In my own lab environment, I have Exchange 2013 up and running under the domain stevieg.org. I also have an SSL certificate with SANs mail.stevieg.org and autodiscover.stevieg.org for Exchange. "Sharepoint.stevieg.org" is ready for the SharePoint 2013 installation. I'm using a new server named SG-SP01 running Windows Server 2012, with SQL Server 2012 Standard edition joined to the same domain as the Exchange infrastructure. Now that media is ready for SQL Server 2012 and SharePoint 2013, we're ready to proceed. Since this is a lab environment, let's go with the SharePoint 2013 installation basics. After fulfilling the prerequisites, run a complete installation. Once the install has completed, run the SharePoint Products Configuration Wizard. During configuration, choose Create a New Server Farm, then specify which SharePoint user will access the database, along with the database server itself. Leave the remainder of the settings at their defaults and wait for SharePoint 2013 to configure the base settings. Figure 1. Start the wizard to begin configuring the SharePoint 2013 farm. 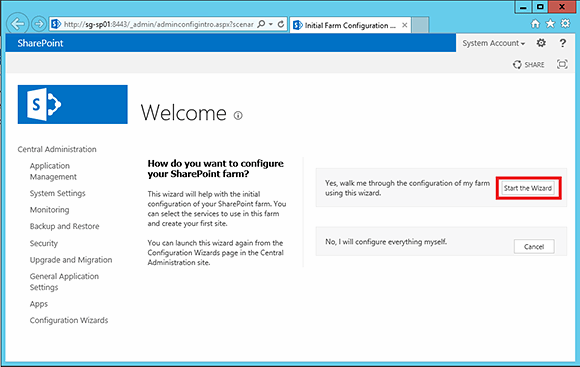 After the configuration wizard completes, begin the initial farm configuration by accessing the SharePoint Central Administration website, which launches automatically from the Configuration wizard. Click Start the Wizard (Figure 1). Select Use existing managed account to leave the default managed account as is, then click Next to begin the farm configuration. After the default farm is successfully configured, click to Skip over creating a new site collection for now. Figure 2. 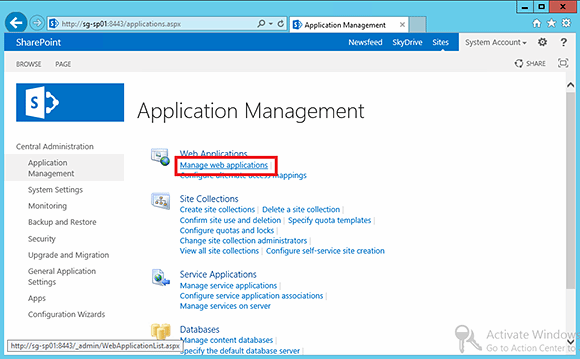 Manage Web applications from the SharePoint 2013 Application Management page. Our site mailbox base is built upon a HTTPS-enabled Web application and site collection, so navigate to Central Administration, then click Application Management. On the Application Management page, click Manage web applications (Figure 2). Next, click New. This tells the wizard to create a new Web application. Create a new IIS Web Site. "Yes" for the radio option next to "Use Secure Sockets Layer (SSL)." Now that we've created our Web application, we can see the Application Created page. Click Create Site Collection to begin creating our initial site collection. You'll now see the Create Site Collection wizard. Choose a suitable name for your base site collection and grant permissions to a suitable account (Administrator) that can access the SharePoint 2013 site. Click OK. Figure 3. 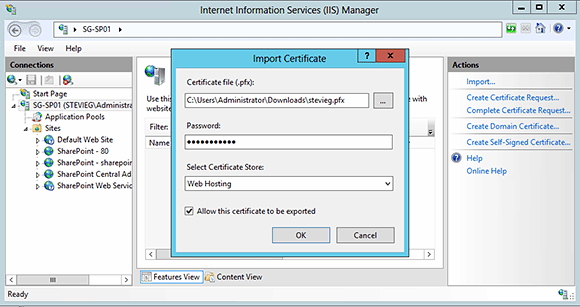 Import your certificate using the IIS Manager console. We now have an available Intranet Information Services (IIS) website to apply our SSL certificate to. 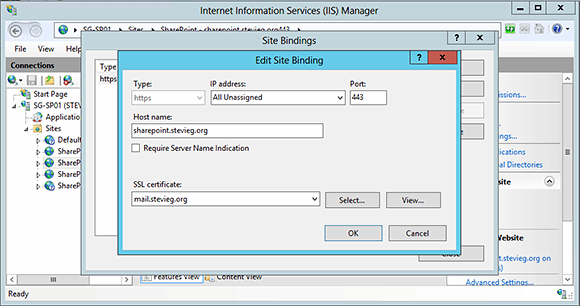 In our lab environment, we've added the SharePoint site name to our Exchange SAN certificate, so we'll import it into IIS via the IIS Manager console (Figure 3). Figure 4. Select your SSL certificate. We must now assign the imported SSL certificate to our new SharePoint site. To do so, select it from the tree view on the left-hand side, then right-click on it and select Edit Bindings. Choose the single HTTPS binding on port 443, then click Edit. Next, select the SAN/UCC certificate from the SSL certificate drop-down (Figure 4). The base HTTPS site collection is now available to access in our lab environment at SharePoint.stevieg.org. 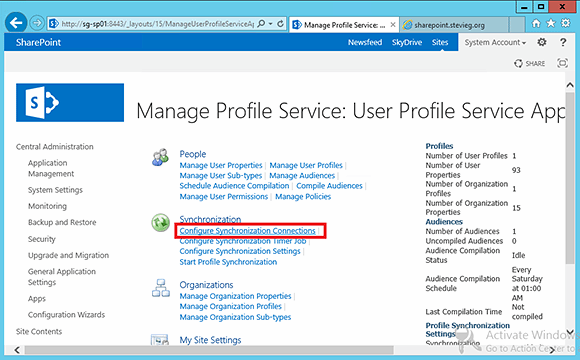 The final task within the SharePoint Central Administration is to configure User Profile Synchronization. This ensures that user properties are kept up to date within SharePoint 2013; these properties include email addresses and other important information that Exchange 2013 site mailboxes rely on. Figure 5. Begin setting up the User Profile Synchronization Service. To begin, activate the User Profile Synchronization Service. 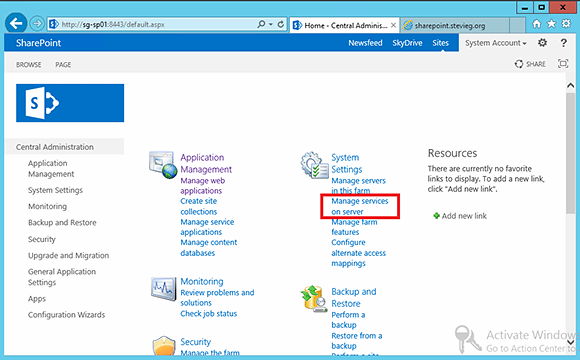 On the SharePoint 2013 Central Administration page, click Manage services on server (Figure 5). On the Services on Server page, scroll down to User Profile Synchronization Service and click Start. When prompted, enter credentials for the account that will run the User Profile Synchronization Service. Next, refresh the Services on the Server page to monitor that the service has in fact started successfully. Figure 6. 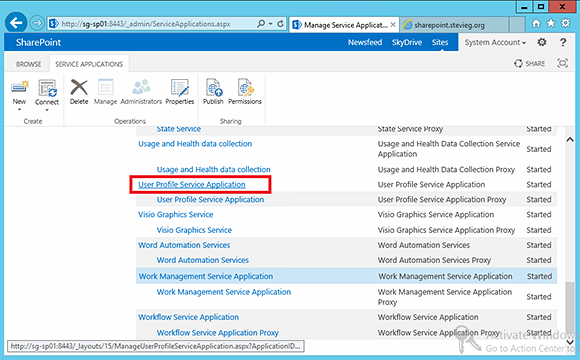 Click "Manage service applications" in the SharePoint 2013 Central Administration console. Now, return to the SharePoint 2013 Central Administration homepage and begin configuring the service. To do so, navigate to Manage service applications, which is listed under Application Management (Figure 6). Figure 7. Next, click on "User Profile Service Application." Next, scroll down and select User Profile Service Application (Figure 7). Configure a connection to the Active Directory forest. Initiate synchronization and automatically create a schedule for incremental updates. Figure 8. Configure synchronization connections via the SharePoint 2013 Central Administration console. To begin, navigate to the Manage Profile Service page and click Configure Synchronization Connections (Figure 8). Forest Name. The fully qualified domain name of the root forest. Auto Discover Domain Controller. In a simple domain structure, it's fine to allow the domain controller to be auto-discovered. Account Name and Password. An account with Directory Sync Rights, as detailed on Microsoft TechNet. Within the lab environment, I've entered Administrator credentials, which -- although not suitable for a production environment -- will allow you to get up and running. Port. Leave at the default LDAP port of 389. Containers. Click Populate containers to retrieve domain and organizational unit information from Active Directory. Scroll down and click Select all to include the entire forest. Save your connection. Return to the Manage Profile Service page and click Start Profile Synchronization to begin the initial directory sync. Note: This also sets up a basic schedule for subsequent synchronization jobs (seen on the right-hand side). Now that the SharePoint-specific components are configured, we just have to configure Exchange integration before we're ready to use site mailboxes. The core technology used for communication between SharePoint and Exchange is Exchange Web Services, so we must download and install the Exchange Web Services Managed API on the SharePoint server. It is available via the Microsoft Download site. The final task is to tie both Exchange 2013 and SharePoint 2013 together to enable site mailboxes. To start, we must configure SharePoint so that site mailboxes are first enabled within SharePoint itself. Then, we must provide SharePoint with information about our Exchange 2013 organization. Figure 9. Name the new SharePoint site. Now that all the configuration steps are complete, we're ready to provision our first site mailbox. 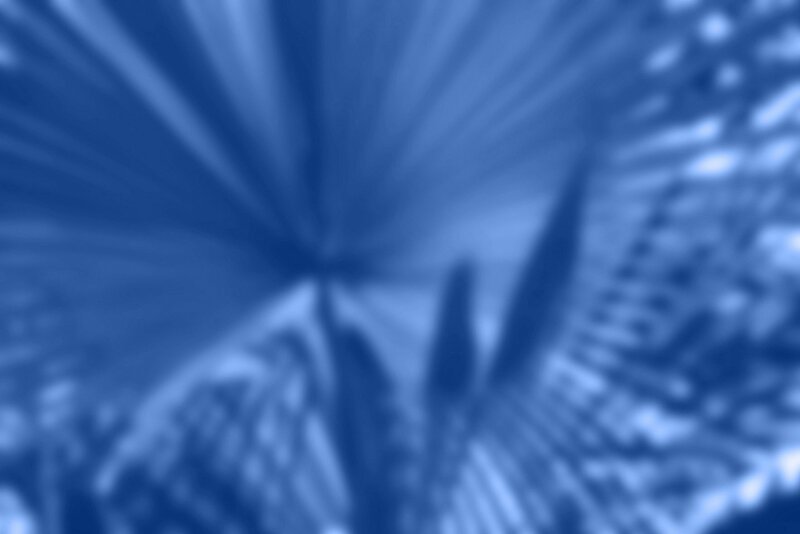 To begin, we must create a subsite within the Site Collection. 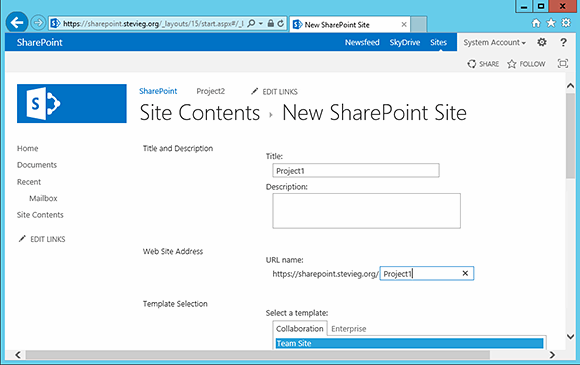 To do so, navigate to Site Contents in SharePoint 2013, then click New Subsite and enter the title as "Project1" (Figure 9). Figure 10. 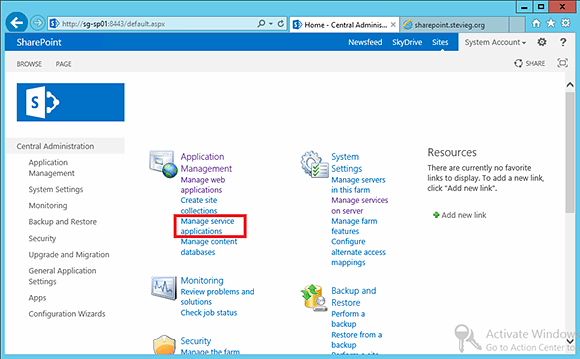 Add an app in SharePoint 2013. 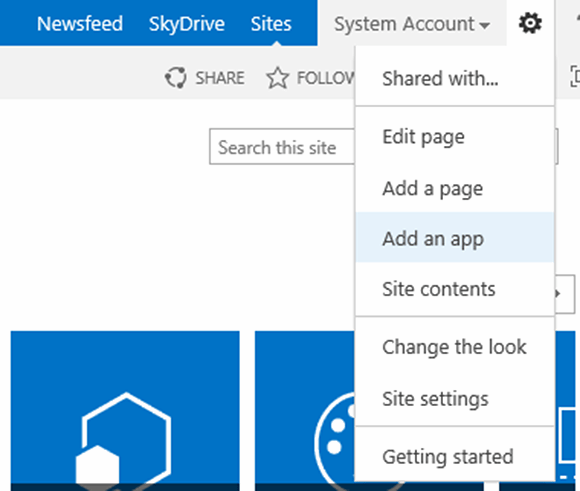 Within the new SharePoint site, navigate to Add an app, which is located within the configuration drop-down (Figure 10). Figure 11. 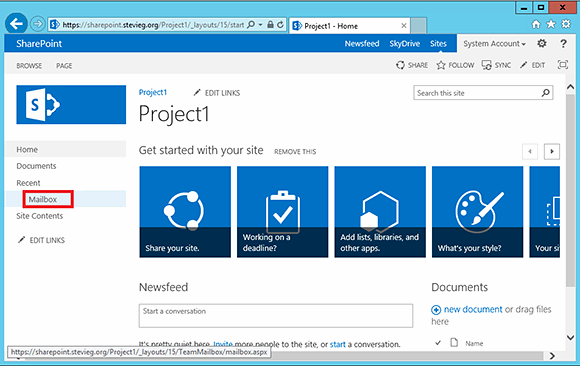 The site mailbox is now available within the SharePoint site. Now, from the Your Apps page, choose Site Mailbox from the list. Figure 12. Your Exchange 2013 site mailbox is now ready to use. 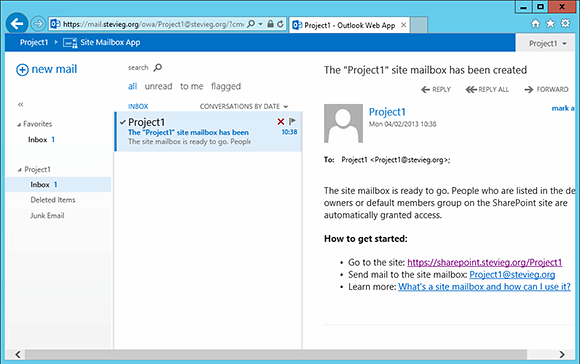 You will now see the mailbox available on the SharePoint site's homepage. Select it to begin provisioning the site mailbox in Exchange 2013 (Figure 11). After the mailbox has been provisioned, you can finally access the site mailbox (Figure 12). If you're viewing mail via Outlook Web App (look back to Figure 12), you'll see that mail associated with the site mailbox is integrated within the SharePoint site itself and that documents are shown within SharePoint. Figure 13. We can now see the site mailbox from within Outlook. If you're on the desktop using Outlook 2013, the view is slightly different; Documents and Mail are combined within Outlook (Figure 13). Steve Goodman is an Exchange MVP and works as a technical architect for one of the UK's leading Microsoft Gold partners, Phoenix IT Group. Goodman has worked in the IT industry for 14 years and has worked extensively with Microsoft Exchange since version 5.5. We have now Exchange 2013 On-Premises with Sharepoint 2013 On-Premises. We will implement Site Mailboxes. Steve, would happen to know how to configure Office 365 so that a specific domain is used when a Site Mailbox is created? we have many active domains and the wrong one is being selected when we create new site mailboxes. I can change them after creation, but this is not scalable.